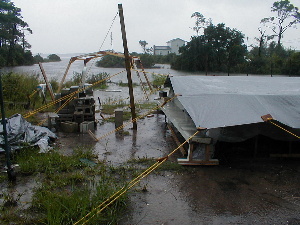 September 14, 2002 Sub-tropical storm Gustav blew through and if the tide had been a few inches higher the Cherokee would have launched herself. But the crew was snug inside working on the interior. 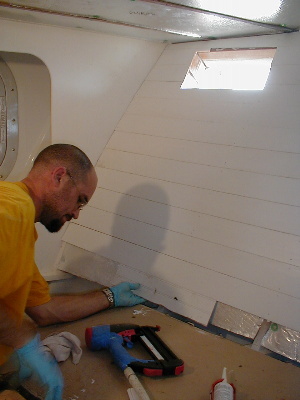 Chris Hunt is shown below installing quarter inch spanish cedar beadboard in the V-berth. 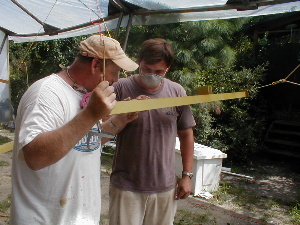 On the hull sides, he’s placing the tongue and groove slats backside out to give a smoother look to the walls. This eliminates the bead. 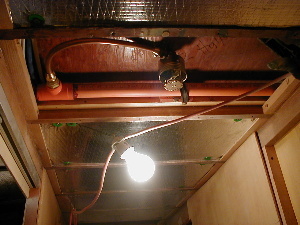 To the right, the ceiling overhead is turned with the bead out. 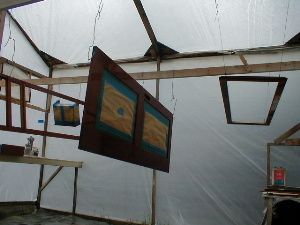 All the T&G boards were primed with four coats, sanding between each one, to come up with a smooth base for top coating. Once they’re all installed they will get a light sanding, one more light prime coat, and then the final top coat. 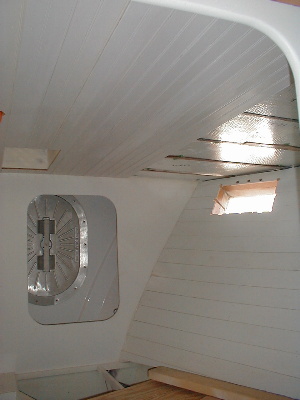 Every wall on the interior of the boat will be painted in this way before the boat is launched. What shines like gold, lets in the sunlight, and frames the ocean blue? Portholes! Jeff and Norm are polishing, prepping, and installing all the port lights. 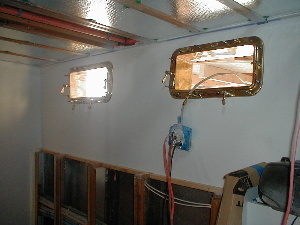 The port lights are held in place by through-bolts that are threaded into the finishing ring on the outside of the boat. The bolts are threaded through holes on the interior frame of the port light where nuts are located and the port light is pulled securely into place. 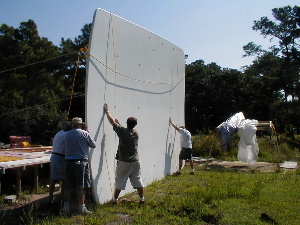 It takes about a tube and a half of urethane caulk per port light to ensure an absolute water-tight seal. The bolts inside will be finished off with brass acorn nuts. Work on the interior doors and drawers is finishing up. 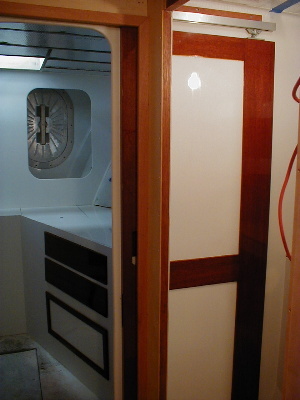 Above left, cabin doors dry in the paint room, and to the right is a hung door with drawers in the V-berth. The fire suppression sprinkler system is being installed – below is a sprinkler head fed off the one-inch trunk line. The sprinkler system can be fed water in three different ways. The two Headhunter pumps that operate the domestic water system aboard Cherokee will feed the grid with as much as sixty pounds of pressure from a 250 gallon water tank. Next, the system can be fed from shore water at about 30 pounds of pressure. Third is an inch and a half FDC (fire department connection) which will allow a fire truck to connect directly to the sprinkler system just as you see in large public buildings. Shown below is the location of the console. 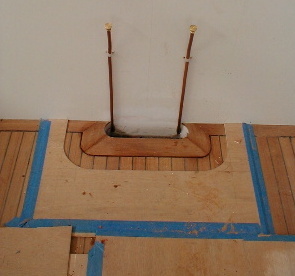 The hole will allow many wires to pass through, making all the connections to the helm. The two copper tubes are manually-operated “dip sticks” to check the fuel in the main tanks. These will serve as back-up to the Headhunter tank monitors. Kerry and Joe finished priming and painting the framework that fits over the engines to create the cockpit floor system. 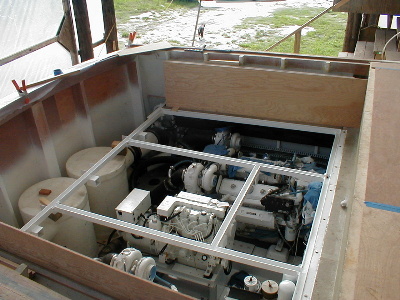 The framework is now permanently installed in the boat. The hard top was flipped over, an endeavor that took the strength of the whole crew. Work has started on the topside, such as placing the half inch copper tubing that will feed the sprinkler head in the pilothouse. Kerry and Jeremy have spread a coat of microballoons to fill the weave of the cloth.